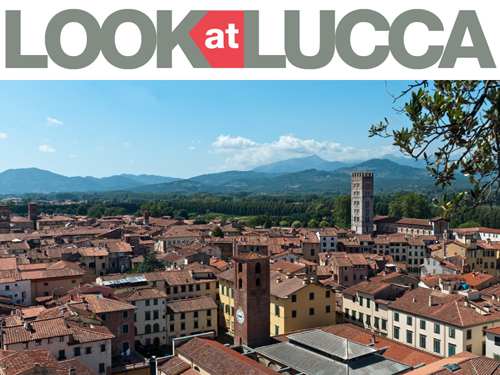 With the excuse of visiting markets, Christmas street markets, nativity scenes, Christmas exhibitions, you can also tour Lucca. Let’s unite pleasure with …. pleasure …. in just five easy steps. This is one of the most beautiful and little-known churches in Lucca. The Christmas period is a perfect time to visit it. Its name is aristocratic and important. The Rolandinghi family, in the Early Middle Ages, resided in this square leaving the high-sounding name to the Church. It also has another name used by the locals, Santa Maria Nera, and shortly we will discover why. The church has a sober exterior but is richly decorated inside as was the case with the majority of the palazzos of Lucca’s aristocracy. Columns, arches, altars, and lavish frescoes done by the best artists of the period. For religious festivities, the church is decked with rich furnishings and sumptuous tapestries made by famous goldsmiths and anonymous needleworkers and embroiderers. At the altar of the right aisle, there is the tomb of Saint Giovanni Leonardi. To become a friar, he gave up his career as a pharmacist and chemist. In virtue of this, he became the patron saint of pharmacists. From the left aisle, we can access the Santa Casa of Loreto, the Holy House in which the Blessed Virgin Mary is believed by some Catholics to have lived, transported to Loreto. In 1662, an exact replica of the house in Loreto was built here in the church. It enshrines a copy of the Black Madonna of Loreto. 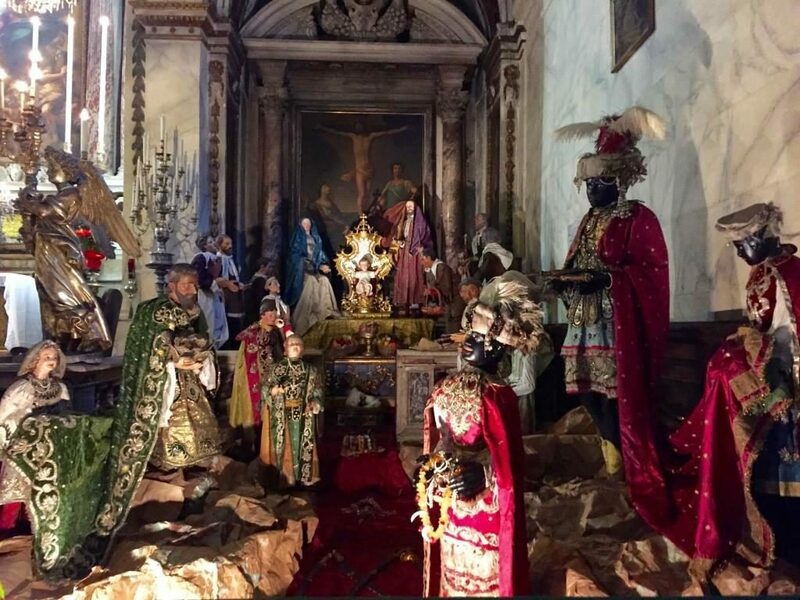 Actually, today, the Black Madonna of Loreto is a copy of the one in Lucca. During a fire, the original one in Loreto was destroyed, and because here in Lucca there was a precise duplicate, they were able to make another one for Loreto. Every year, from 8 December, the church sets up a precious nativity scene. There are twenty figures of various heights. Some are Neapolitan. The Three Wise Men are magnificently dressed in silk, velvet, and damask. It is believed that the velvet mantle embroidered in gold, of one of the Magi, is one of the earliest examples of velvet woven by the renowned craftsmen of Lucca. In addition to the historic nativity, there is also a small display of ‘portable’ nativity scenes. Visitors can vote their preferences. If you have some extra time, you can wander (quietly) through the rooms of the State library and the monumental rooms, the former library of the monastery. 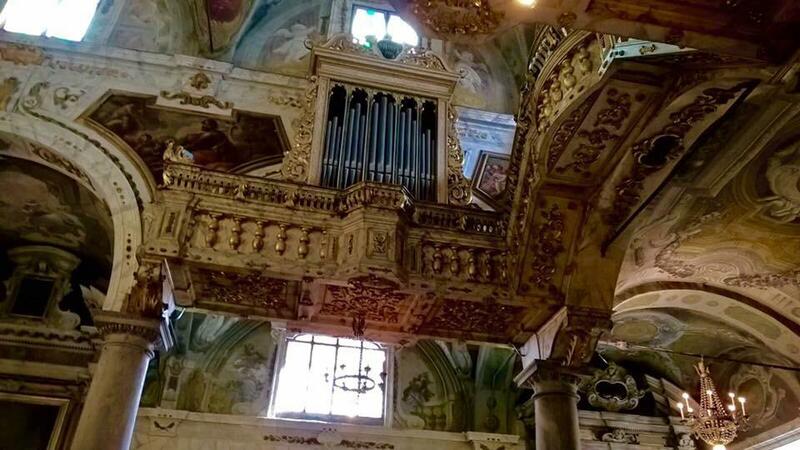 If you are lucky, you might be able to enjoy a Baroque music concert on Christmas Eve and witness how the church resounds in all its splendor. The people of Lucca miss the market that used to be held in this former convent. They reminisce about the good old days when you could buy heads of different types of lettuce and fresh local peaches stacked in wooden crates, or broccoli, cardoons, and rapini (broccoli rabe) laid out on marble counters. Visitors can still admire the simple unequivocal structure of the convent of the Carmine: the delicate columns of the cloister and the large windows of the upper portico. The building, which has been undergoing a lengthy restoration, often hosts exhibits more or less food-related. In this period, there is an exhibition tied to seeds, ‘nutrition’ in a broad sense, where the theme is the birth and growth of life through the seed, staged in a super display unit, designed by the architect, Mauro Lovi, creator of many such visionary exhibits both in Lucca and abroad. On this occasion, it is a marvelous library of the seed, the real seed as well as the artistic and symbolic one. If you need a little break, you can stop for a ‘vintage’ espresso or cappuccino at the tables of the small corner café inside the portico. You might have children with you, so how can you convince them to accompany you while you shop along Via Fillungo? Easy, just plan a small chocolate hunt and, that way, they will be happy to walk with you along the most elegant street of the town flanked by fashionable shops and turn-of-the-century jewelry shops. Cavalsani, which is next to the Church of San Cristoforo (the former seat of the Silk Guild of Lucca). Ristori, which has retained both the name of the famous perfume shop that was located here and its turn-of-the-century furnishings. Chocolat, in Chiasso Barletti, the narrow street in front of the medieval Clock Tower. Should the children want to indulge in more chocolate, there is also Caniparoli, located in Via San Paolino. They have a large and heavenly-scented shop with a Sachertorte second to none. And do not think that chocolate is new to Lucca. In the 17th century, cocoa was introduced to Tuscany by the Florentine Francesco d’Antonio Carletti. In the National Library of Florence there are numerous documents, dating from the beginning of the 1600s, in which the benefits of chocolate are described, especially its soothing effect. In Lucca, excise duties on chocolate appeared in 1719 and a century later, there were five chocolate shops in Lucca. This intense season will end shortly before Christmas Day with two street markets, the Crafts Market in Corso Garibaldi and the Fair Trade Market in Villa Bottini. The 16th-century Villa Bottini is just off Via del Fosso and the medieval gate of San Gervasio, the former east gate of the medieval Walls. It was built by the Buonvisi family. In addition to being one of the most beautiful villas in Lucca and territory, it is of great historical significance: its elegant design was so greatly appreciated that it became a model for many of the subsequent villas built in the countryside. Because of its large garden, unusual in Lucca, it was denoted as Villa Buonvisi ‘al Giardino’ literally ‘at the garden’, to distinguish it from the many other villas that the powerful Buonvisi family owned in the countryside of Lucca. When Elisa Bonaparte purchased the villa during her reign in the early 1800s, she had trompe l’oeil frescoes painted, wisely leaving the original stunning 16th-century frescoes of the main salon and portico, by Ventura Salimbeni, untouched. So in addition to knick-knacks and gifts, check out the beautiful frescoes and above all, don’t forget to visit the kitchens. There will be lots of crafts on display but take in the original stoves, wood-burning ovens, and large pietra serena stone sinks as well. Stroll in the garden, move beyond the stands down to the furthest enclosure of the villa, where there is a great stone portal that leads to a nymphaeum attributed to the best architects of the 16th-century. Also note the monumental London Plane tree on the Via del Fosso side (planted by Elisa) and the picturesque view of the street through the huge wrought iron gate. How can you complete a Christmas tour of Lucca without taking in of one of the many concerts held in churches, theatres, and practically everywhere during this period? Just a few blocks away from Villa Bottini, in the auditorium of the Church of San Francesco, there will be a concert on 21 December at 9 pm. The Ensemble Vivaldi, of the Solisti Veneti, will perform the Four Seasons by Antonio Vivaldi, the Christmas Concerto by Arcangelo Corelli, and a tribute to Giacomo Puccini. On 22 December, at 9 pm, the church will also host a Christmas benefit concert with the Orchestra of the Teatro del Giglio. The auditorium is the actual church of the former convent. It has a unique architecture following the simple design of Franciscan churches but is full of works of art and memories relating to Lucca’s history. Some altars display the emblem of the weavers’ guild as the church was a gathering place for the weavers. Many had their workshops along the nearby street, Via del Fosso. Among the many illustrious figures buried here, there is the great 18th-century musician born in Lucca, Luigi Boccherini. If you prefer to go for a relaxing stroll ending with a choral concert, up on the Walls in the Casermetta San Pietro where the seat of the Balestrieri (Crossbowmen) is located, the choral group, Il Baluardo, welcomes visitors to listen to choirs from the territory. Performances are every Saturday of December and Sunday 6 January, at 4.30 pm. And so we conclude our Christmas tour of Lucca: with music on the monument that best represents the city. The Walls of Lucca are a must-see in any season of the year and walking along them is always unforgettable. Posted in Blog ed etichettato Christmas, holiday, Lucca, shopping, suggestion. Bookmark the permalink.